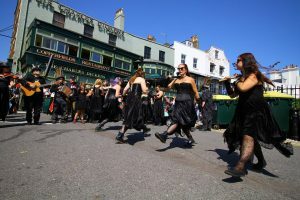 We are very pleased that this year some members of Wolf’s Head and Vixen Morris will be travelling up to dance at London Folk Festival before the main concerts start so another reason to arrive early. Wolf’s Head and Vixen Morris are a Border Morris side. This is the most primitive and arguably the most exhilarating of the Morris dancing styles.